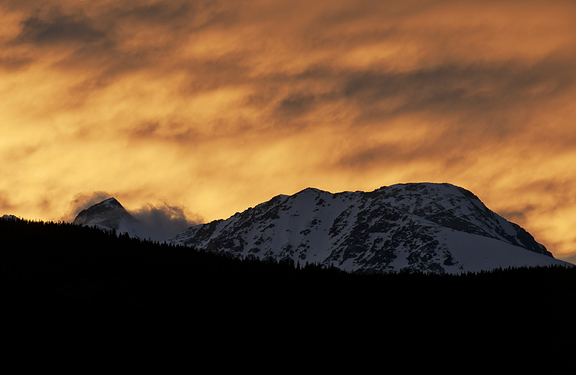 Summer is taking her sweet time getting to the Colorado high country, and I’m fine with that. I got my first sunburn of the season over the weekend on a long trail run. The good news is that I was testing a new sunblock which worked really well, wasn’t sticky, greasy, or yucky. The bad news is that I forgot to apply sunblock to the back of my neck. But the other good news is that this tells me how well the sunblock works! I suppose every season requires some new manner of getting dialed in, but the transition from spring to summer is really quite delightful. Jeremy wasn’t off the mark at all. A couple of times when I walked into the room and had that odor hit me, my eyes immediately went to Kaweah. It’s all about gas – that is… fermentation. Kimchi is spicy, yes, but it is also slightly sour, almost effervescent, and a little funky in that wonderful fermented umami way. My pal, Ellen, gets it. She can down a lot of kimchi – that’s how she rolls. Jeremy is fascinated with the fermentation process, but not such a fan of the product and especially the by-products. Ever since HMart (Asian grocer with lots of great Korean stuff) opened a new branch in Westminster (much closer to me than Aurora), I’ve been hankering to make my own kimchi. It’s as if the store beckons to you to make kimchi. 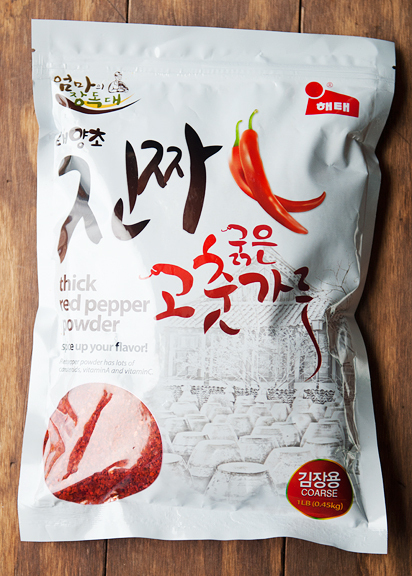 Their napa cabbages and Korean radishes fill an entire section of the produce area, and then there are the stacks and stacks of 22-pound bags of Korean red pepper powder. Holy moly. I had to wheel around the store several times before I found the wimp-sized 1-pound bags for newbs like me. Sweet rice flour is also called glutinous rice flour. In today’s culture, that happens to be a most unfortunate translation. There is no gluten in the sweet rice flour, it is called glutinous because it is sticky as hell. This is the stuff you use to make mochi or to immobilize arch enemies. It is gluten-free. 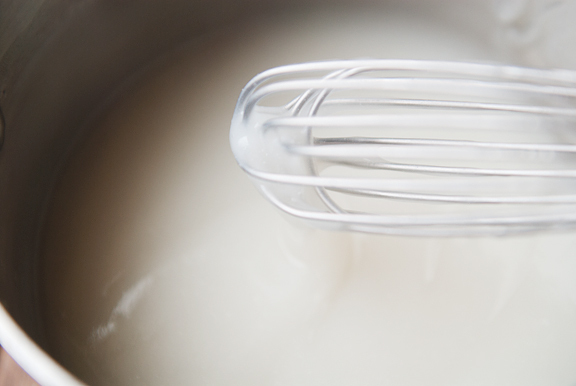 Now, if you are celiac, please take note – not all fish sauces are gluten-free. The brand I prefer (Three Crabs) is totally NOT gluten-free. So if you want to make this, then you should source (i.e. Google) a good gluten-free fish sauce. The Korean radish is a kind of daikon radish. 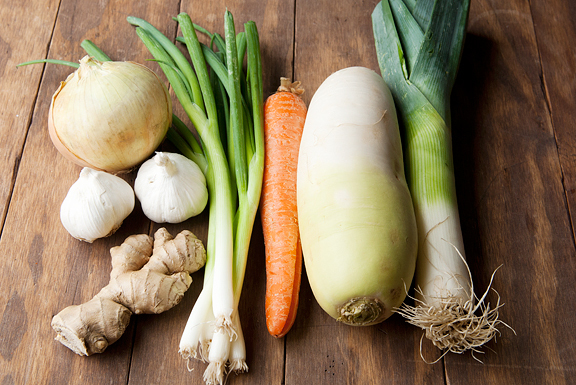 It is white and green, but if you can’t find it, use daikon radish instead. While prepping all of the ingredients for the paste, the cabbage should be soaking in salted water. Turn the cabbage over every 30 minutes for a total of 90 minutes soaking time. 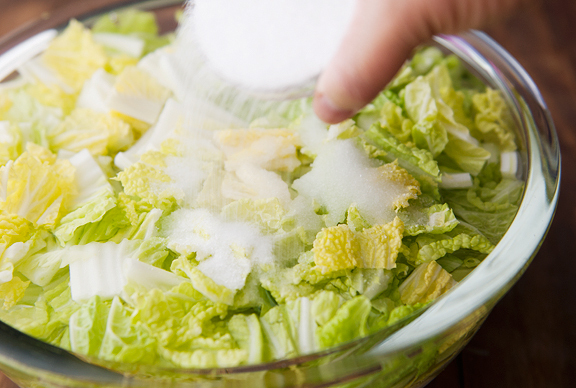 After 90 minutes, rinse the cabbage in cold water three times and drain the water off. I squeezed mine out a bit – you don’t have to. I didn’t realize there were so many other ingredients in kimchi. I guess I’ve always just shoveled it into my mouth without inspecting it closely. Of course, I have a jar of store-bought kimchi that I compared to my homemade version. 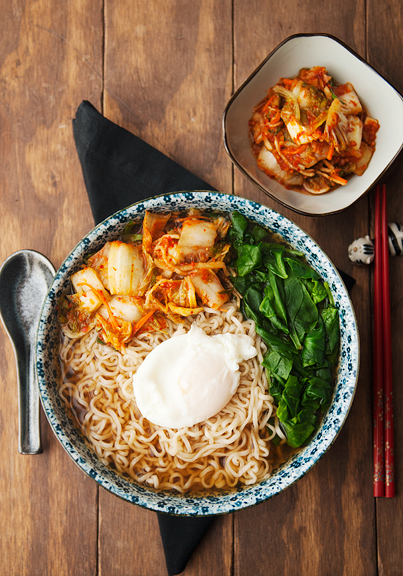 The store-bought kimchi really skimps on everything but the cabbage. I like that this recipe is chock full of goodies. Next time, I will cut the radish in larger strips or chunks because I love crunchy spicy radish kimchi. One ingredient I omitted from the original recipe is the salted squid, and that was mostly out of sheer laziness. I’ve seen some recipes call for dried shrimp as well as or instead of the salted squid. If you want to make this vegetarian, The Kitchn makes a version using kelp powder. 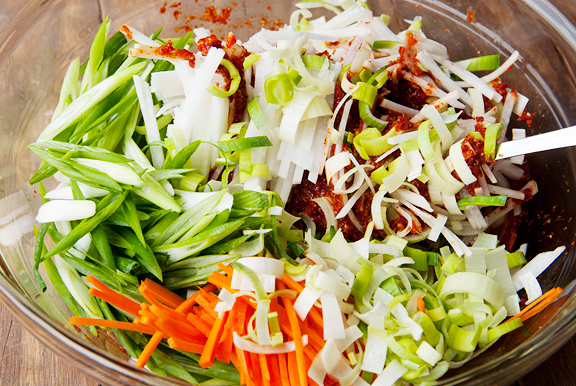 Press the kimchi down into its container so that the liquid rises above the solids. Leave at least an inch of head space in the jar. I found after a day, I needed to transfer some of the kimchi to another jar so it wouldn’t leak liquid out the top. You might want to set your container over a plate or something similar to catch any liquid that does leak out during the fermentation process. I opened the jars and pushed the kimchi back down twice each day to release the carbon dioxide (a byproduct of the fermentation) and keep the liquid over the cabbage. After a couple of days, you will start to get the sour taste. I let mine go for 5 days because I really like that tanginess of the kimchi. 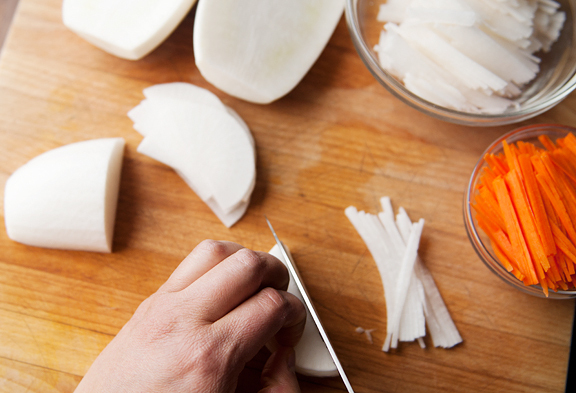 Once the kimchi is where you like it, put it in the refrigerator. That will slow the fermentation process considerably. Even though I absolutely love this kimchi, I’m glad I made half of the original recipe (the recipe below is half of the original). It makes a lot of kimchi and if you are the only one in the household eating it, you may not want or have space for 2 gallons of kimchi. And you can certainly reduce the recipe by half or a quarter as is your wont. I’m just thrilled that kimchi is so easy to make at home! 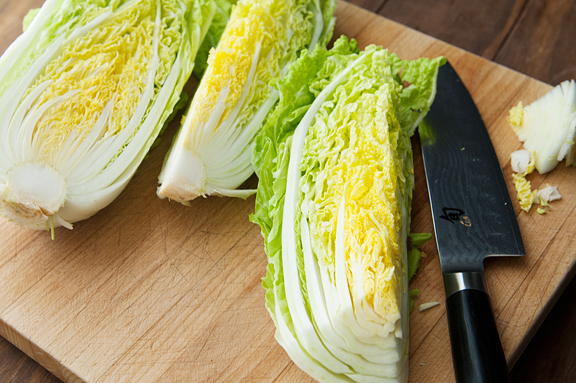 Prepare the cabbage: Remove any wilted outer leaves of the napa cabbage heads. Quarter the heads lengthwise and cut out the cores. 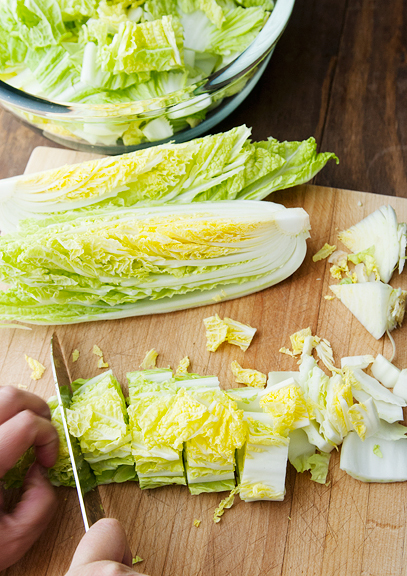 Chop the cabbage into bite-size pieces. 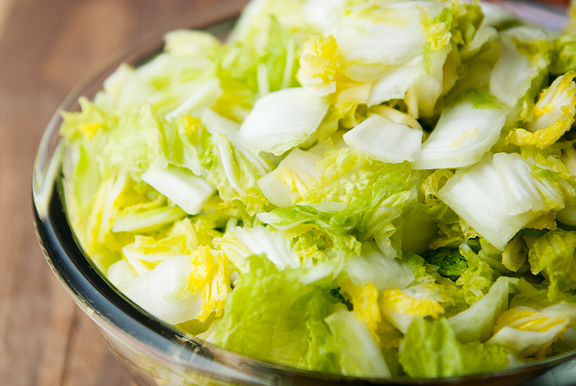 Place the cabbage in a large bowl of water (use two large bowls if it won’t all fit). 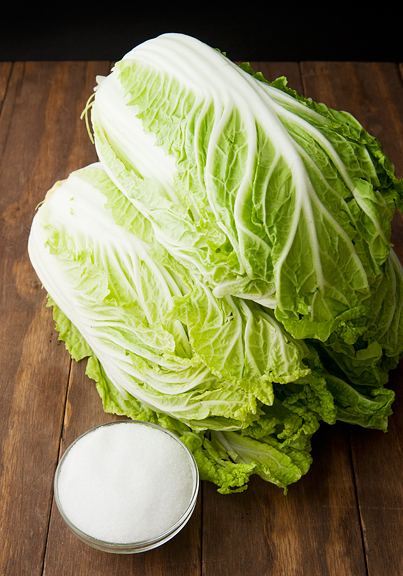 Sprinkle the salt over the cabbage (divide it accordingly if you have multiple bowls of cabbage). Turn the cabbage every 30 minutes to get an even brining for a total of 90 minutes. Rinse the cabbage in a large bowl of water three times. Drain the cabbage and set aside until ready to use. 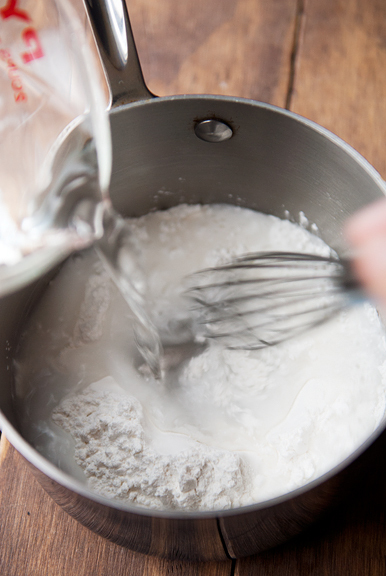 Prepare the paste: Combine the sweet rice flour and the water in a small saucepan. Stir over medium high heat until the mixture comes to a boil. 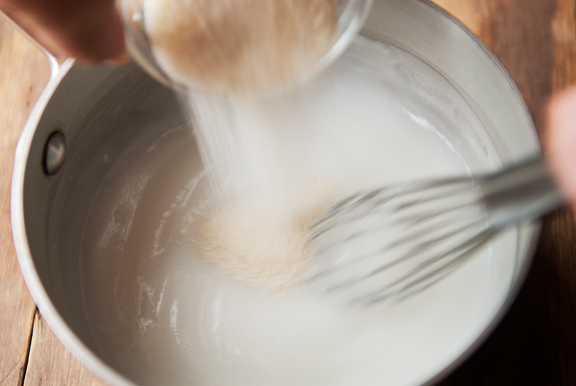 Keep stirring until it is bubbling and then add the sugar. Continue to stir until the mixture turns somewhat translucent. Pour into a large (really large) clean bowl. 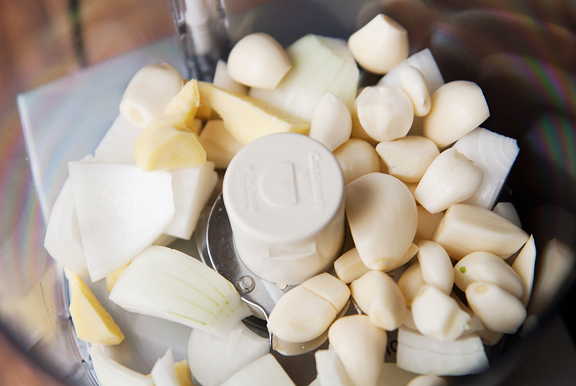 Place the garlic, ginger, and onion in the bowl of a food processor and purée. Add the purée to the sweet rice paste along with the fish sauce and the red pepper powder and mix it all together. 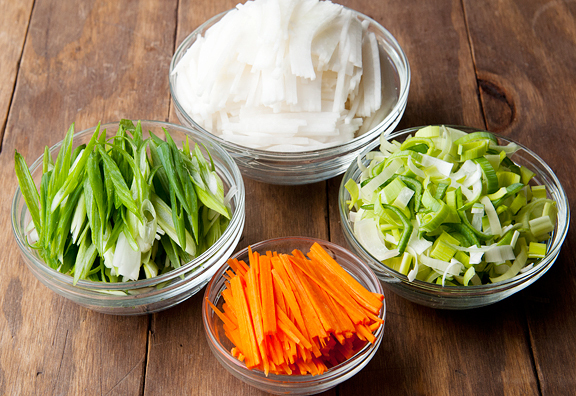 Stir in the green onions, leeks, Korean radish, and carrot until the vegetables are well-coated. 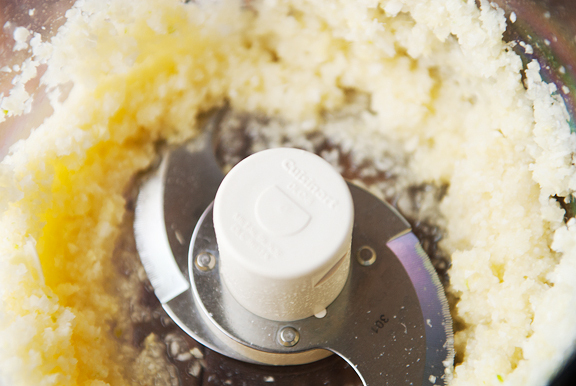 Mix and ferment: Add the cabbage to the paste and mix by hand (wear a disposable glove – you will be happier for it later) until all of the cabbage is evenly coated with the paste. 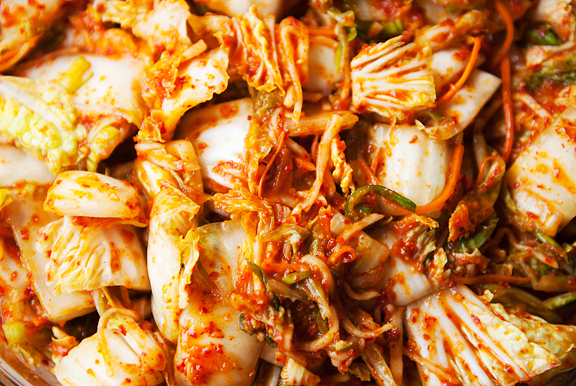 Pack the kimchi tightly into an airtight container (glass jar, plastic tub, etc.). You may have to use multiple containers. Push the kimchi down so the liquid covers the top, but leave at least 1 inch of headspace in the top of the container. Let the kimchi sit on the counter for a day with some sort of plate or bowl to catch any leaking liquid underneath the container. If it is fermenting, there will be gas bubbles developing down in the kimchi which pushes the liquid up and possibly out of the top of your vessel. 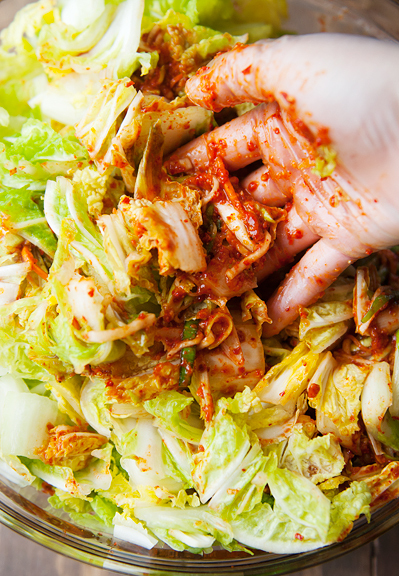 Open the lid once or twice a day to let the kimchi de-gas and to push the cabbage back down into the vessel. After 2 days, it should start to sour a little (this is good!). If this is the right taste for you, seal it up and place it in the refrigerator to enjoy as you like. I let mine go 5 days and it was AWESOME. Makes a gallon. M1 gave me a lovely book all about ferminating foods. During the heat of the Texas summer I have promised myself to dive deeply and sincerely into its wonderland. I must remember this recipe. The benefits of eating sourdough bread (made thru a fermentation process itself) has proven to aid in controlling glucose levels in diabetics. As I age, I learn more and more about the benefits derived thru fermentation. Kisses and warm snuggle hugs to Kaweah. Wow! That looks delicious! Everyone at my house loves kimchi but I have yet to make it myself. Thanks for the recipe! 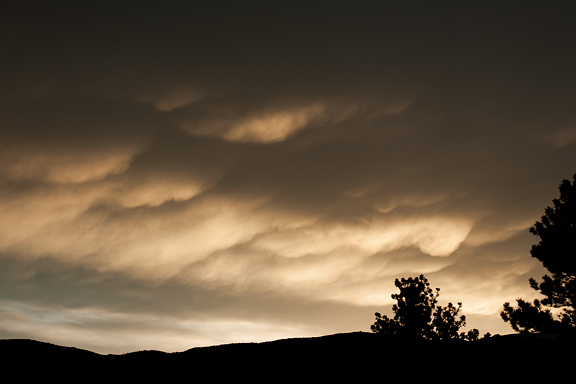 Thanks for your beautiful photo essay! 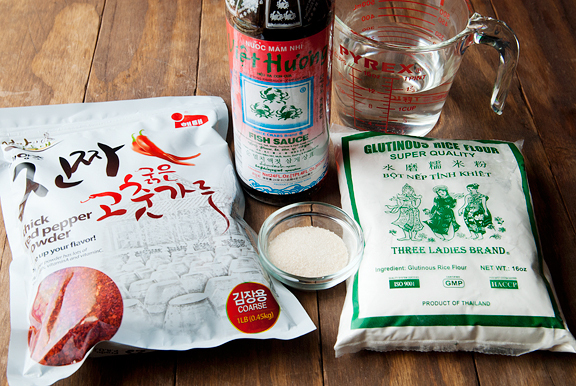 Makes it foolproof to make this Kimchi. I can’t wait to make this! I made kimchi once a few years ago and I was so pleased with it, I think I’ll do it again. Thanks for the reminder! Your posts are fascinating, whether I want to make the recipe or not. Having only tried kimchi once (at DisneyWorld of all places), I think I’d better try it before diving into making it! Can you tell us what sunblock you are using? I’m very fair and always on the lookout for a great sunblock that isn’t greasy – thanks so much. You got a full suspension mtn bike there? I ride a Specialized (a bit heavy) but it’s fine for the amount of riding I do. Are you riding through snow? Do you get a good grip on the tires when you’re climbing? The kimchi looks delicious! I love eating it with wet rice on weekend mornings. 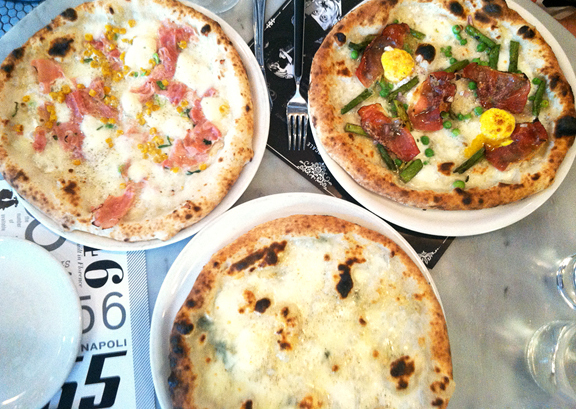 Ah, comfort food! Also, I do agree with you about putting on gloves when preparing, because I am taking a foodservice management class right now and I am learning lots about foodborne illness and how to avoid it. 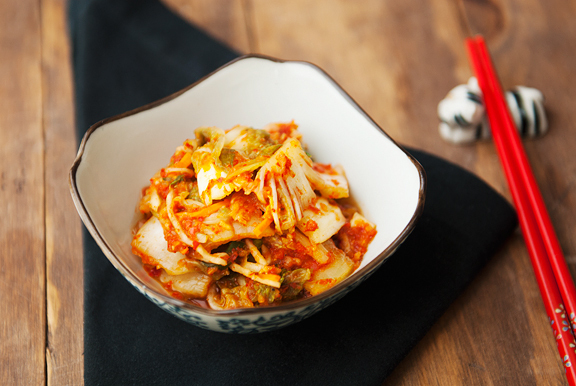 We absolutely love kimchi! I’ve been too lazy to make it, and the gaseous byproducts scare the heck out of me (I’d blame it on the 4-year old). You can use your leftover kimchi to make kimchi fried rice – so yummy and a favorite in our house! This looks great! I’ve never tried kimchi but my fiance is convinced that the health benefits make a try worthwhile. I will definitely give this a try. I need a new sunblock! Can you tell me which one you were testing out? 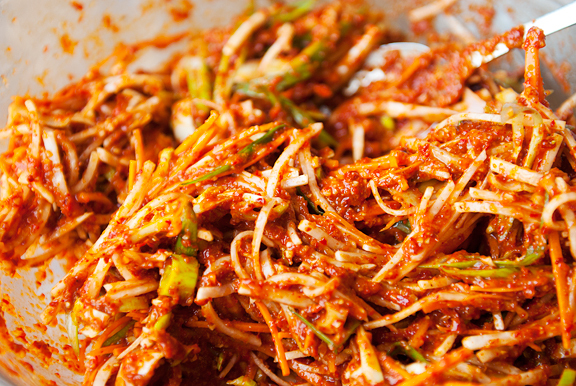 This kimchi recipe looks fantastic – thanks for sharing! I concur that “too much tiramisù” is nonsensical… but I’d be happy to help out with that problem all the same. Hmmm, I’ve been toying with the idea of making kimchi for a while, but have been too intimidated to actually do it. You make it seem so straightforward… I may just have to take the leap! 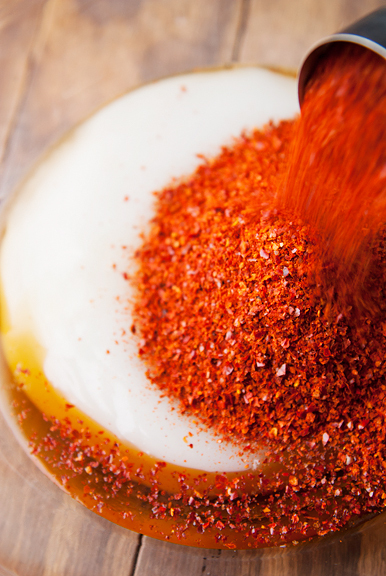 The kimchi sounds great, but what kind of sunscreen did you find that works so well?! Same as others, what kind of sunscreen worked well for you without being greasy? 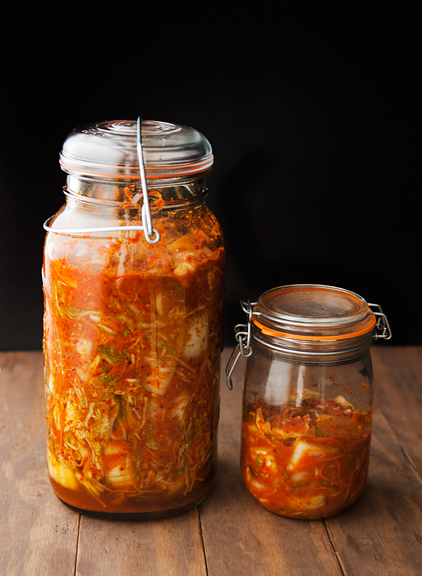 I love kimchi and all things fermented/vinegary! Once, I basted a whole onion in vinegar and let it reduce in the oven. My roommate, who hates everything vinegary and calls pickles “cucumbers soaked in pure evil” woke up from a nap, batting the fetid air away from his face saying, “WHAT FRESH HELL IS THIS?! ?” In my defense, I thought he wasn’t home. I love fermented things like sauerkraut but have never had kimchee. I think I’ll give this a try. I would also like to know about the sunscreen you found that wasn’t greasy! Anne – then yours is probably a good house to make kimchi!! Kristin – yeah, it’s definitely one of those acquired tastes! Barb – yes, it’s the TerraSport SPF 30. Pey-Lih – hard tail. 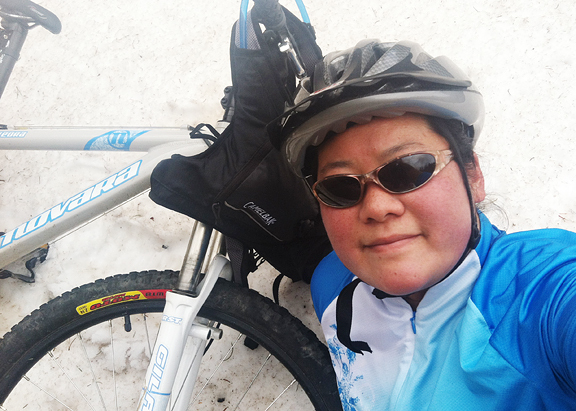 We are riding up to the snow and through small patches of it, but you have to push through to maintain decent grip. Lisa – oh, I hope you guys like it. FlannelJammies – TerraSport SPF 30. Christina – I was the same way, but it’s really not so bad when you sit down to make it! Kimberly – TerraSport SPF 30. GwenO – TerraSport SPF 30. 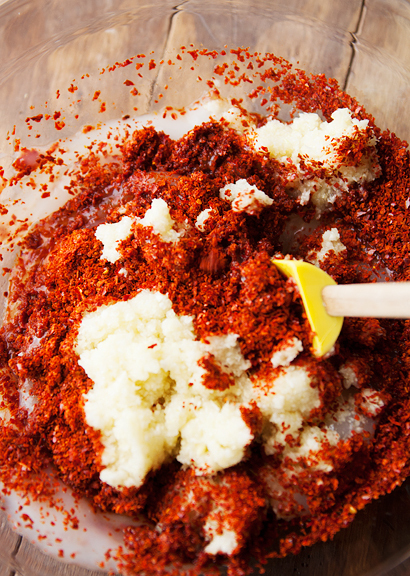 Judy – You might want to take a taste of some prepared kimchi before diving into making it (because you will have a lot of red pepper powder leftover). But I hope you do like it! The sunscreen is TerraSport SPF 30. I like it a lot. I’m also testing the Vanicream equivalent, but haven’t had enough days with it yet. Wow~ You are so amazing. That’s exactly how we make kimchi though. I live in Korea, definitely I’m a Korean. I’ve been just browsing some foodies’ blogs and then spotted out your Kimchi recipe so I was curious about how you made it so I read it. How impressed! you are so much better than me. Are you Korean? or Do you have any Korean background? friends? Anyway, so fantastic! I give you two thumbs up! !